Pyxis Medstations are automated medication dispensing units with numerous electronic features to ensure safety, accuracy and efficiency. In our hospital, over 1,000 new medication orders are written by prescribers and processed every day. 13,000 units of medication are dispensed on the care areas every 24 hours. The process for dispensing this medication is paper-based and manual with nurses selecting medication from a patient drawer or from the unit supply. Patient safety is of utmost concern in our hospital, and the Pyxis system will help ensure the best possible healthcare for Central Albertans. Automated medication dispensing will ensure possible allergies, drug interactions, and duplicates in therapy are reviewed before medication is given, reduce the chances of a patient receiving the wrong medication, only allow access to medications approved for that patient, warn if a medication is selected too early or too late for a patient, provide additional instruction and information on medications to healthcare providers, enhance communication between the pharmacy and nursing. The technology will further ensure medication dispensing safety with ‘bedside medication verification’. Once a medication has been selected for a patient, the nurse will scan the patient file at the bedside before administering the medication to that patient.2019 proceeds will be used to purchase Pyxis Medstations for use in emergency, the intensive care unit, operating room, recovery room, unit 22 (cardiology), & other critical care areas at the Red Deer Regional Hospital Centre. Red Deer Hospital Lottery Proceeds from the Lottery have exceeded $8.5 million since its inception; the lottery has become a huge success and has plenty to celebrate! 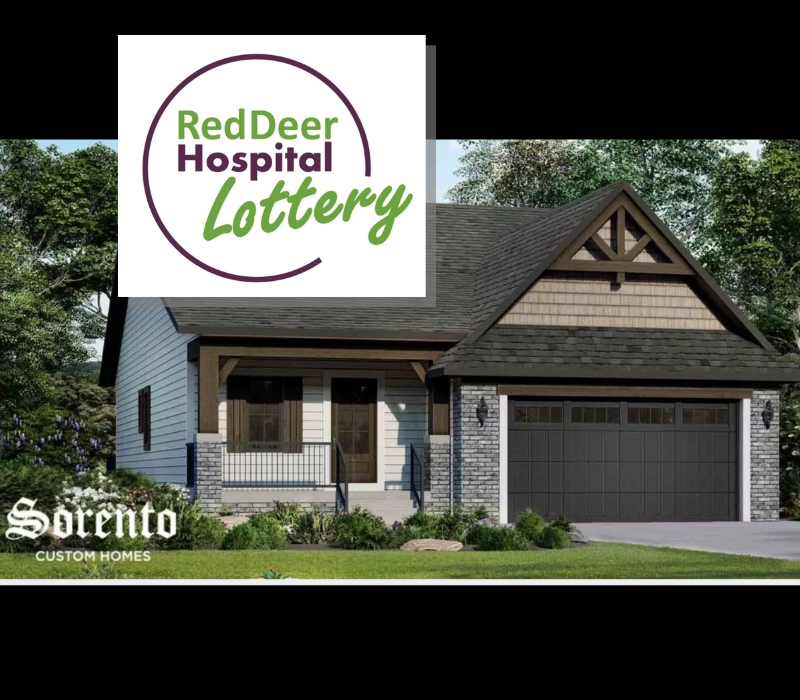 For a fifth exciting year we are proud to partner with Sorento Custom Homes for the 2019 Red Deer Hospital Lottery Dream Home! The 2019 Red Deer Hospital Lottery Dream Home, designed by Sorento Custom Homes, makes a strong statement of luxury and design. This $840,000 bungalow features 3,110 sq ft of developed living space. It’s a perfect family home with 3 bedrooms, 2 1⁄2 baths, and a master chef kitchen with adjoining butler pantry. You’ll love the high vaulted ceilings in the main living space, accented with wood beams & two large skylights, plus a full height brick fireplace. Enjoy the convenience of the 5 piece ensuite, connecting to a large walk-in closet and adjoining laundry room. Finish off this beautiful unique home with an impressive wet bar, and $40,000 worth of gorgeous furnishing provided by The Brick. Our Dream Home is located in the community of Laredo on the south east corner of Red Deer. There are 100 prizes to be won valued at more than $1.1 million. This year’s Early Bird prize is: $25,000 Cash! Don’t forget the MegaBucks 50 Raffle with a minimum cash payout of $100,000. Last year’s winner took home $250,000! 2019 proceeds will be used to purchase Pyxis Medstations, automated medication dispensing units with numerous electronic features to ensure safety for patients at the Red Deer hospital, and accuracy and efficiency for hospital staff. Tickets for the Lottery are $25 each, 5 for $100 or 15 for $250 Call 403.340.1878 or toll-free at 1.877.808.9005. The show home is open to the public beginning March 15 at 1pm. Show home hours are March 15 – March 31, Daily 1-5 p.m.; Starting April 1, Friday – Sunday 1-5 p.m. Closed Good Friday, open Easter Sunday. Early Bird cutoff is 11pm May 27, 2019. Final Ticket Sales cutoff is 11 pm June 24, 2019.